Ex-girlfriends count as probably the biggest inspiration in pop music. They inspire songs, sometimes whole albums, and in rarer instances, band names as well. Born in Rocky River, Ohio in 1974, Kevin Barnes had a Canadian girlfriend (yes, she was from Montreal) while living in Athens in the mid-nineties, and after breaking up with her, he named the musical project he formed in 1996 Of Montreal. It started out as a one-man outfit and only became a proper band after he returned from Minneapolis and Cleveland where he was looking for suitable members. Finally he recruited bassist Bryan Poole and Derek Almstead; together they recorded their Beach Boys and Beatles-influenced debut Cherry Peel, which came out in 1997 on Bar/None Records. All the songs were written by Barnes, who already at this point had a unique talent for witty psychedelic songs. The album received very positive reviews and still counts as a highlight in Of Montreal’s career. 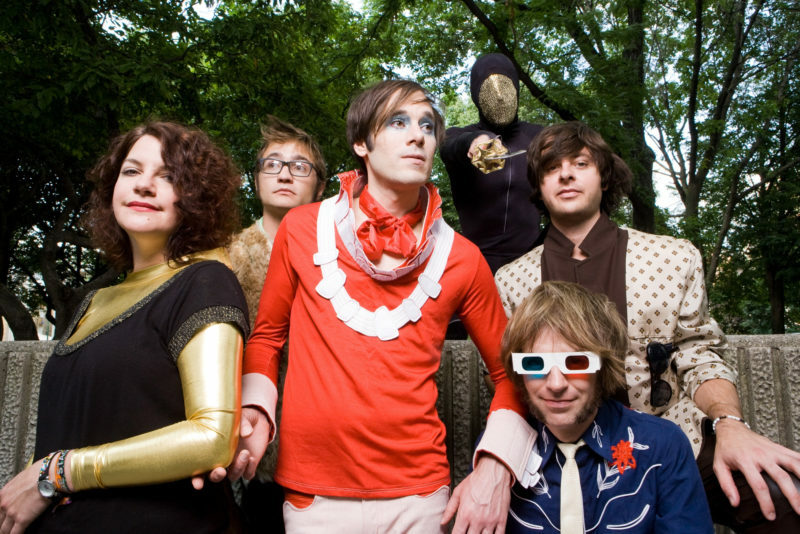 The band became identified as part of the so-called Elephant 6 scene – a collective of independent artists who shared their love of 1960s psychedelic pop music (its other notable participants included The Apples In Stereo, Elf Power or Neutral Milk Hotel). The LP was followed by an EP called The Bird Who Ate The Rabbit’s Flower, after which Poole departed (and Almstead switched to bass). This started a sort of tradition in the career of the band, as its line-up has constantly changed over the years. The new additions were Dottie Alexander (who remained until 2013, longer than anyone else, apart from the frontman) and James Huggins, but Barnes still made the sophomore effort The Bedside Drama: A Petite Tragedy pretty much on his own. Just like the debut, this album presented his trademark lengthy song titles such as The Couple In Bed Together Under A Warm Blanket Wrapped Up In Each Other’s Arms Asleep. 1999’s The Gay Parade was hailed as indie rock’s very own Sgt. Pepper by a music journalist, and its artwork was designed by Kevin’s brother David, who has been responsible for all of the band’s album covers since then. In 2001 came the follow-up titled Coquelicot Asleep In The Poppies: A Variety Of Whimsical Verse (the longest album title in the OM catalog so far) – a 70-minute concept album that was loosely inspired by Os Mutantes, Frank Zappa and The Beach Boys’ troublesome album Smile. 2002’s Aldhils Arboretum was a departure from the concept format, intended as a sort of singles collection. Two years later, Satanic Panic In The Attic already came out on Polyvinyl, and this time around, the Beach Boys influence didn’t come from Smile but its predecessor Pet Sounds. The next record, The Sunlandic Twins, was recorded partly in Norway, and in 2007, Of Montreal finally broke through. Released around the time Barnes was splitting from his Norwegian wife, the mother of their child, Hissing Fauna Are You The Destroyer made the Top 75 in the USA. It was another concept effort, telling the story of Barnes’ cross-dressing alterego George Fruit. Hailed as a masterpiece, the album is receiving a 10th-anniversary deluxe treatment at the moment. There was more success ahead: 2008’s Skeletal Lamping entered the Top 40, just like False Priest, containing duets with Janelle Monae and Solange Knowles, two years later (this one remains Of Montreal highest charting entry at 34). The next LP, Paralytic Stalks received mixed reviews, and perhaps that was why 2013’s Lousy With Sylvianbriar became more radio-friendly. Aureate Gloom was made quite in the same vein two years later, and 2016 saw the release of OM’s latest album Innocence Reaches. Inspired by Barnes’ well-known heroes (The Beatles, Brian Wilson, David Bowie, Prince etc. ), it is an important record in this extraordinary discography of an amazing artist who is totally unpredictable on stage and even goes as far as to performing naked. There is perhaps one thing that can be predicted about the Of Montreal gig on the A38: it won’t be predictable and it won’t be boring.